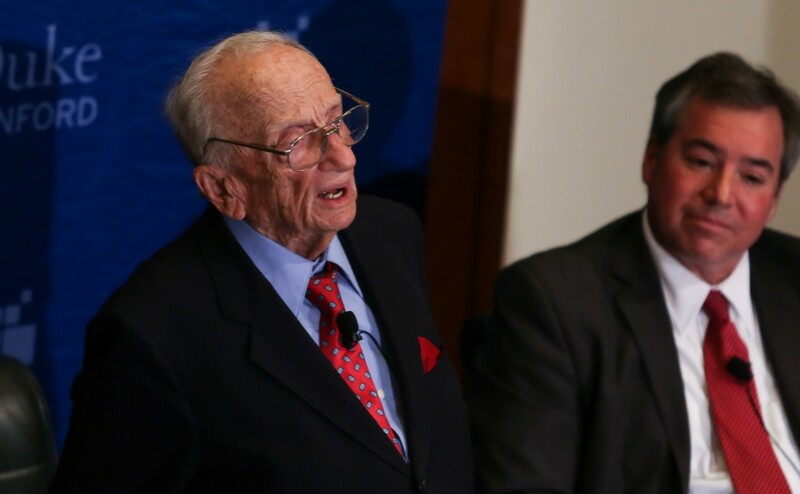 "Ben Ferencz, the last living prosecutor from the Nuremberg trials, advocated for 'law, not war' to a crowd of several hundred packed into Sanford Fleishman Commons and other adjoining rooms Wednesday. "At 27 years old, Ferencz became the chief prosecutor for the U.S. Army at the Einsatzgruppen trial—his first case—which tried 22 defendants for the murder of more than a million people. Deemed 'the biggest murder trial in history' by the Associated Press, the trial resulted in the conviction of all the defendants. More than 70 years later, he reflected on his experience at Nuremberg, highlighting how the trial changed perceptions of war and international crimes against humanity. “War had always been glorified. It was a national right, a right of sovereignty. It was hailed as a road to power and prestige, [but at Nuremberg], war was condemned as an international crime [for the first time],' Ferencz said during a discussion mediated by his son Donald Ferencz, a renowned international lawyer, and Duke alumnus Michael Scharf, Trinity '85, Law '88 and dean of Case Western Reserve University School of Law." See the full article in the Duke Chronicle.